An emergency pick-up turns out to be useful. 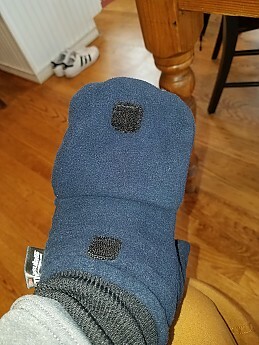 These are light Polartec fleece fingerless gloves that convert into mittens—a piece of fleece folds over to cover your fingers. The mitten part sits out of the way via a small piece of hook/loop on the back. I find myself using these more than I expected, love the versatility. 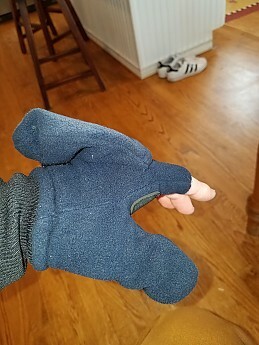 When you're heading to a cold weather football game and forgot gloves....you buy what you can. I found these at a college campus outdoors store in Evanston. 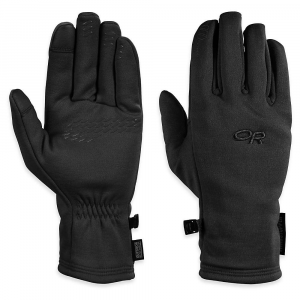 What do these offer that a typical fingerless glove does not? First, the fleece is layered, and there is a tiny bit of Thinsulate backing the fleece. 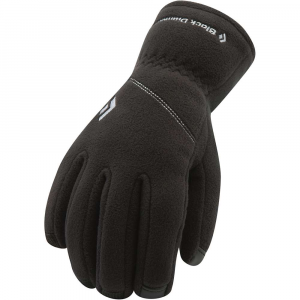 They are warmer than you would expect, and correspondingly feel a little bulkier than you would anticipate. However, fingers can move freely. They also have a reinforced palm. The material feels like neoprene—it's pretty smooth. 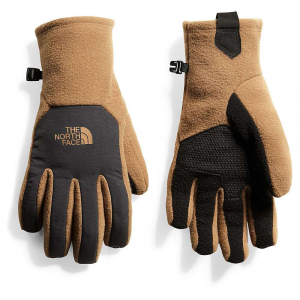 I might have chosen goat leather or something with a little more grip, but they're nice with a pair of trekking poles. 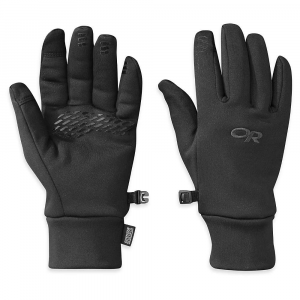 They also have a slash/hole in the thumb for those who want to fool around with their smart phone in cold weather. The wrist is knit and elastic. More elastic than some might prefer. They have a little loop and clip so you can hook them together and hang from a zipper pull if you want, a cheap but useful feature. The main thing about these, though, is the mitten flip top. As you can see, it sits out of the way, stuck there by a dot of velcro/hook-loop on the back of the glove. Looks Gorky but does the job of keeping it out of your fingers. When it gets colder, fingerless gloves turn into mittens. 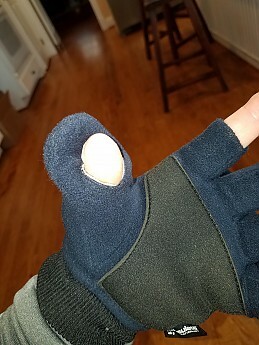 fingerless mode above....mitten mode below. 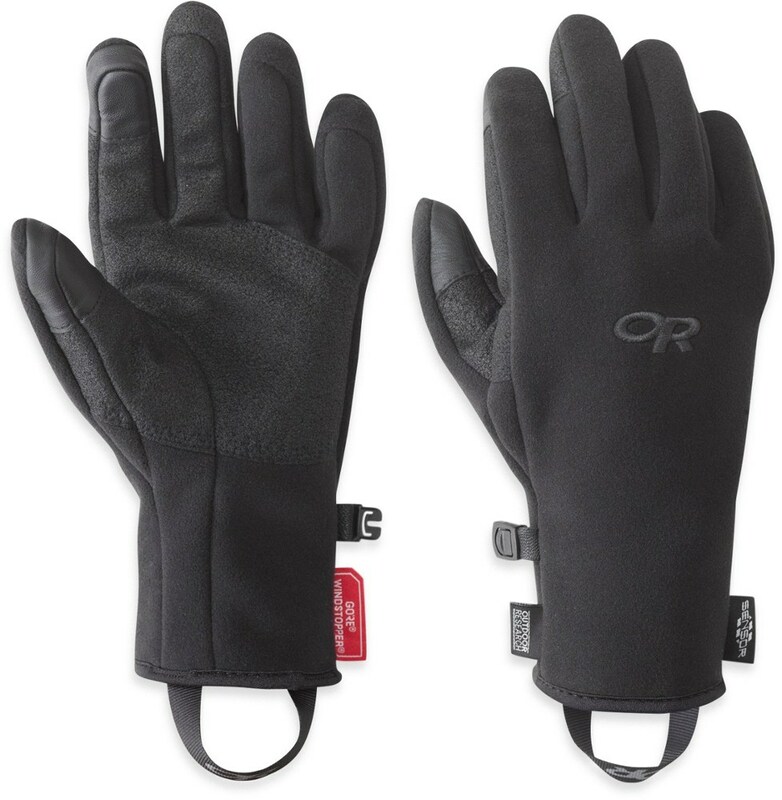 This might be close to perfect handwear for students—keeps them warm in a variety of weather conditions, fingertips are free to text or take pictures with the smart phone. 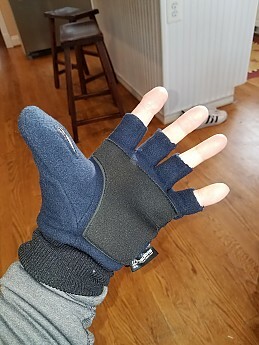 Not something I would normally spend a whole lot of time with, as I have old pairs of liner gloves with the fingers cut off that I use for cooking and other work where I want my fingers free, and they're a lot lighter-weight. Yet I keep reaching for these when it's chilly because I like having that mitten there. These don't block wind—blows right through, more or less. 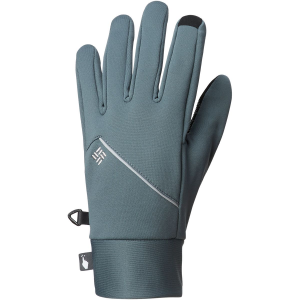 Consequently, though, they wick moisture and breathe about how you would expect for a fleece glove/mitten—quite well. I can't speak to the quality, they're only a few months old, but so far, so good. 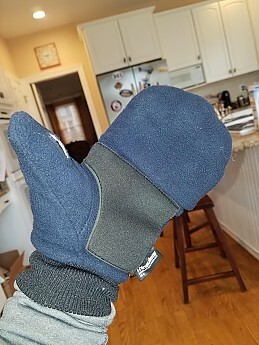 The thumb slit is something I haven't seen in mitts like these before. But if they aren't windproof I don't see much value. Good review, as always, Andrew! Nice find, Andrew. Thanks for sharing this. 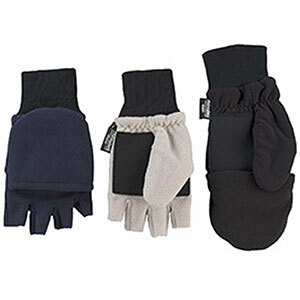 The Broner Fleece Flip Top Mitten is not available from the stores we monitor.